The Original Corky's "famous" Italian Restaurant, Inc. Welcome to our web site that Nick started in 1998. We are always updating this site and adding new information as well, so please stop by often. This first page begins with our early years where it all began in Connecticut from 1937 to 1995. Page two "CT TO TX" is about the Journey leading up to Arlington, TX. Page three "CORKY'S TX" is the beginning of our Arlington, TX. journey... followed by more pages and information as time evolves in Texas. Our number in Arlington, TX. is 817-561-CORKYS(2675). We are in Lincoln Court Plaza at 4760 Little Rd. Check out our link entitled "Corky's Why We're Different" for more information. We believe in protecting the integrity and authenticity of our craft. Wood-Fired" Brick Oven just as it began in Naples, Italy back in 1889. This IS the quintessential "Old World Italian Neapolitan Pizza". Did you know there are thousands of great pizzerias all over the world but the birthplace of this culinary masterpiece is Naples, Italy! it was made of bread dough, garlic, lard and salt. Only in the mid 1800's did Naples create the "modern pizza" with tomato and mozzarella. flag. The Queen loved it so much that, to this day, the pizza bears her name. Next time you’re in Italy, enjoy a "real" Neapolitan pizza! Brick Oven, to Hartford, Connecticut. He was a true pioneer, setting the benchmark for authenticity and "old-world" tradition. 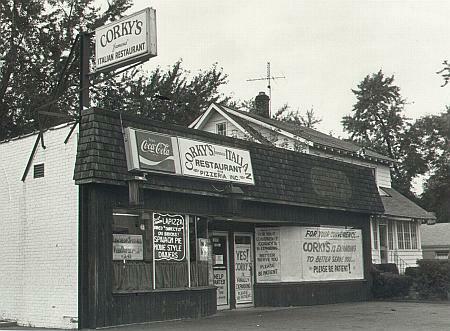 by the Hartford newspapers, Corky's was a "full service" restaurant. tought me everything. My dad was a "consummate chef"! He was able to take left-overs from the fridge and prepared a meal "fit for a king". Food Service Director" by one of Hartford County's largest hospitals. He and my mom thought it best to sell the business and accept the offer. both a tremendous influence in my life. I Love and miss them both. In the early 70’s, I felt led to open my own Restaurant. In keeping with our family's tradition, I named it Corky's. We were also located in Hartford County but across the Connecticut River, just a few miles from where my father began. This Corky’s began as a small 1,500 sq. ft. pizzeria...the left half of the building... as seen in the photograph above. After a couple of years we expanded to 3,000 sq. ft. utilizing the entire building...also seen in the same photograph. After a few more years I purchased the original building as well as several surrounding properties for our final expansion to 8,000 sq. ft.
We employed approximately 45 employees and the menu expanded even more. An arial photograph of this facility is shown below. consisted of authentic Italian Neapolitan style pizza, Sicilian style pizza, broccoli pie, spinach pie, calzone, and homemade garlic rolls. Everything was made fresh to order and baked directly on a firebrick-cooking surface, just as I learned from Dad. Baked delights, you will know that it is truly... a little Pizza Heaven!" In 1995, I retired from the restaurant business and relocated to Southwest Florida. The picture above is what the Connecticut Corky's looked like when I retired in 1995 and moved to Southwest Florida. As the years flew by, I became bored with my retirement and began to miss my first love: the restaurant business. So I put together a plan to return to the time of my life I enjoyed the most. similar to the one I first opened in CT in the 70’s. appetizers and a dessert or two. take me on an unexpected journey. Please click on the link below "CORKY'S CT. TO TX." 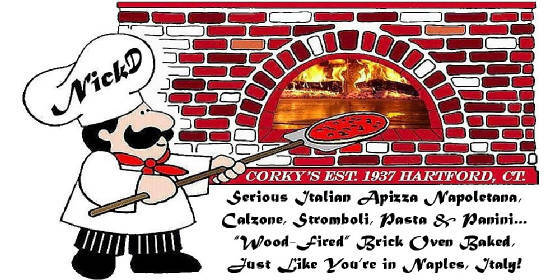 to follow my journey and for updated information on Corky's "Old World Wood-Fired"
Brick Oven Pizzeria in Texas.